In our travels we sometimes chance upon people that impress us with action or attitude that goes beyond the pale. Such was the case on our sojourn to St. Anthony, where we made the acquaintance, albeit indirectly, of a man whose dedication to a cause is truly worthy of note. Neither snow nor rain nor heat nor gloom of night keeps Guy Poole from his worthy cause. Guy Poole is a seventy-one-year-old man on a mission, and it’s one he doesn’t take lightly. A number of years ago, Guy lost his beloved wife to complications from diabetes, and each year since that loss, he’s walked the roads for a cure. In fact, Guy Poole has pledged to keep right on walking until that cure is found, or until he can walk no more. We’ve never actually met Guy, but we became aware of his ambitious aims by way of his St. Anthony family, in whose company we often found ourselves during our stay there. Through their stories and photos we came to know of this determined man with the inspiring lifelong goal. 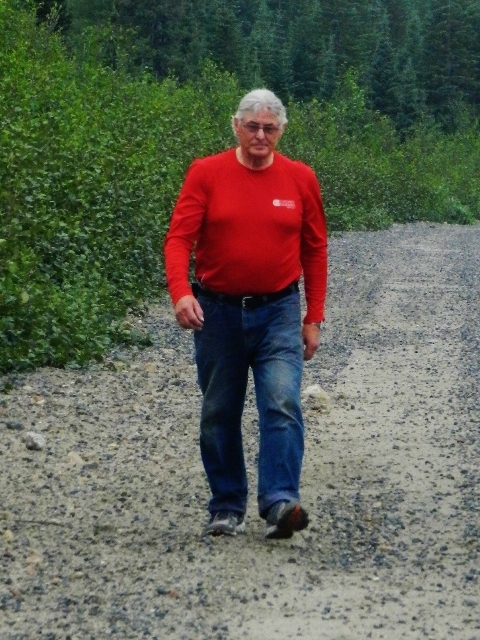 Guy Poole on Liz’s Walk in Labrador. In 2006, Guy began what has come to be known as ‘Liz’s Walk’ as a way to honor his late wife’s memory and increase awareness of the disease that claimed her life and brought such sorrow. But what Guy thought of as a single event became a yearly undertaking after that first walk. As he covered the 200 kilometers from Pinsent’s Arm to Lodge Bay, Labrador, he received a note from a young girl in Charlottetown, Labrador, praising him for his efforts to find a cure for diabetes. She and her family were fighting the battle, too. So touched was Guy by this girl’s missive, he pledged right then and there to walk each year for as long as his legs would carry him, and he’s been going strong on his promise ever since. To achieve this ambitious feat, the 71-year-old Guy trains like an athlete for some months prior to the event, waking by 5:00 AM every morning to traverse his 15 – 20 daily kilometers. He does this seven days a week in preparation for the next season’s walk. That’s a dedication not many could muster. 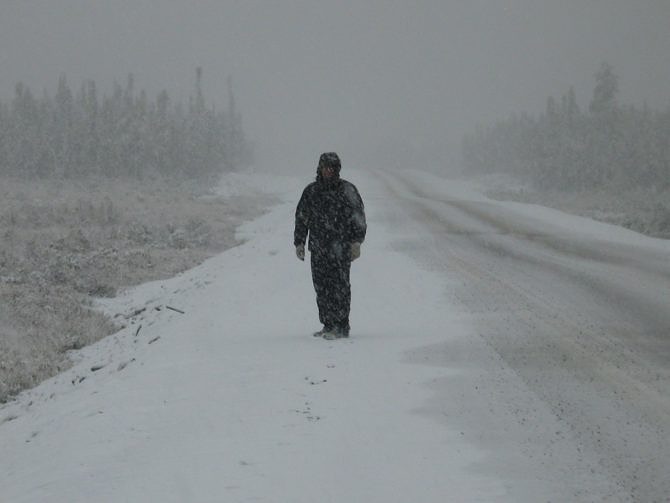 In 2012, Guy completed his walk of Labrador, having traveled from Churchill Falls to the Quebec border near Labrador West, a distance of over 230 kilometers. And in 2013 he began to walk the island of Newfoundland, starting in St. Anthony, at the tip of the Great Northern Peninsula, and working his way toward St. John’s, on the far eastern side of the island. This year, 2015, he completed the Deer Lake to Gander leg of the journey, a ten day trip that saw him covering 30 kilometers each day. To date he has walked over 2300 kilometers and has raised more than $83,000 for the Canadian Diabetes Association. Each year, Guy is supported on his walk by his sister, Lydia, and her husband Bob Mesher, who is the volunteer coordinator for the Liz’s Walk team. And as if the physical feat isn’t challenging enough in itself, Guy also gives talks along the way to groups and individuals—students, running/walking clubs, town council representatives, service clubs, politicians and the general public—who can benefit from his informed words about the cause he holds dear. But there’s more to this journey than the distance traveled. It is no doubt as psychologically demanding as it is physically challenging, and we can only wonder at Guy’s thoughts and feelings as he continues to honor his wife’s memory year after year in this meaningful way. Guy is, in fact, walking for both the past and the future. His is a journey of remembrance and a journey of healing, but perhaps most significantly, his is a journey of hope for tomorrow. 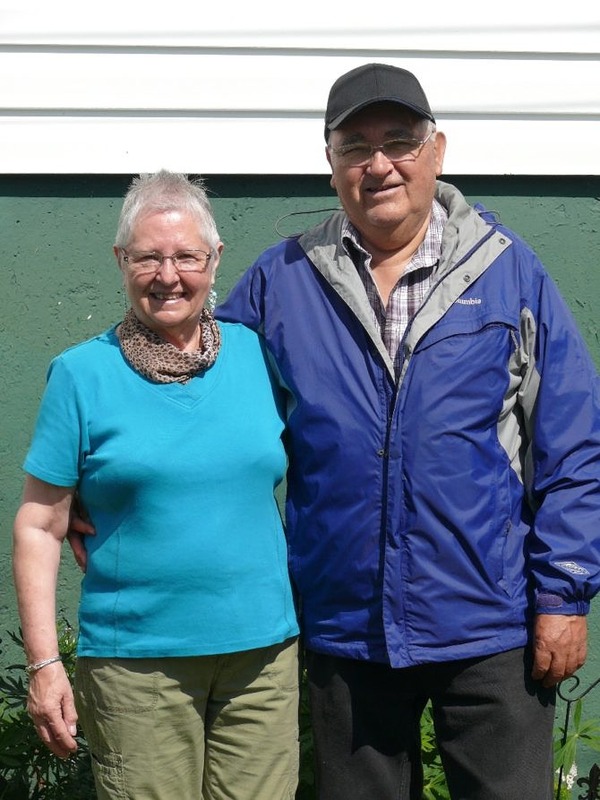 Guy Poole is just an ordinary man, a worker at the Voisey’s Bay power plant, an everyday guy with a big enough heart and a big enough determination to walk for a cure to a devastating illness that afflicts so many. It’s an admirable undertaking, one that requires a large measure of discipline and deserves a large measure of admiration. He has ours, in spades.